We have a tendency to think of Christianity in very individualistic ways, “If I want to be a Christian, that is between me and God; and if I don’t want to be a Christian, that is between me and God.” But the truth is, your decision to follow Jesus – or not follow Jesus – will affect far more than your own eternal life. Your decision could bless – or devastate – your descendants for countless generations. In some families there is a heritage of higher education, athleticism, or military service. In my family, however, there is a heritage of faith. Both of my parents, all four of my grandparents, some of my great-grandparents, and even a few of my great-great-grandparents were Christians. From generation to generation, they passed down a knowledge of, and a love for, the gospel. That inheritance is worth far more to me than if I had been born the heir of a multi-million dollar estate. Their commitment to passing down the faith has helped to ensure that I know the Lord and will live forever with Him. But it really isn’t about me; it’s about my children and my children’s children. My sons are receiving this heritage from my family and from my wife’s family. Nearly all of the family my boys know – their cousins, their grandparents, their aunts and their uncles – are members of the body of Christ. This is a legacy I hope and pray they do not take for granted. When the Lord returns, I am confident that He will resurrect the vast majority of my family to eternal life; and it thrills my soul to consider how wonderful that Day will be. I realize that in the resurrection our relationships will be different (Matthew 22:30), but I sincerely hope we will be able to experience a resurrection family reunion. I want to meet those who’ve gone before me and I want to meet those who will hopefully come after me. I want my great-great-grandmother to meet my great-great-grandson. I want to thank my ancestors for bringing up their children in the discipline and instruction of the Lord; and I want to thank my descendants for honoring their fathers and mothers by keeping the faith. I pray that neither I, nor my children, nor my children’s children do anything to disinherit ourselves and miss out on that great resurrection reunion. The faith that has been passed down to me began with one person from one generation. They probably didn’t realize it at the time, but they were beginning a legacy. And perhaps you are the first in your family to walk with the Lord. Perhaps yours will be the first generation of many to come. If you are a Christian parent, then realize your job is spectacularly important. You cannot, of course, guarantee that your children become Christians, but you can do everything within your power to show them why Jesus is worth following. There is no higher calling in this world than ensuring your children have the opportunity to hear the Good News about Jesus. As you discipline, as you instruct, as you strive not to “provoke your children to anger,” as you pick up toys and help with algebra homework – remember that you are part of something much bigger than yourself. You are helping to ensure that another generation has the opportunity to seize the baton of faith and pass it down to another generation. And just as it only takes one generation to start a legacy, it only takes one generation to destroy a legacy. The second generation of Israelites in the Promised Land “did not know the Lord or the work that he had done for Israel” (Judges 2:10). Some of that was probably that generation’s fault and some was probably the fault of their parents’ generation. Regardless, their unfaithfulness had dire consequences for many generations to come. The point is this: we have to start thinking about Christianity generationally. We have to see the big picture. We have to take what we have heard and “entrust” it to others, “who will be able to teach others also” (2 Timothy 2:2). This is true in the church, as well as our families. Families are not just a mom, a dad, and the kids. Families are grandparents, aunts and uncles, cousins, and grandchildren. We want everyone to be citizens of the heavenly kingdom. We want everyone to be resurrected to life. Our “waiting for new heavens and a new earth” (2 Peter 3:13) should be a family affair. 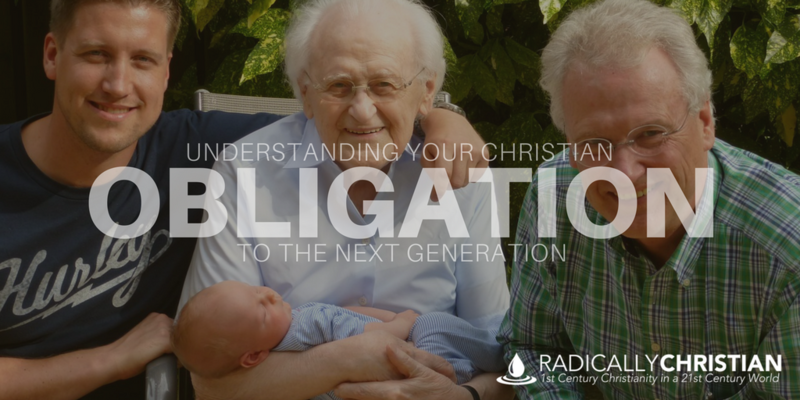 So just remember, as Christians, we all have an obligation to the next generation.